Few names in golf course architecture are as recognizable as that of the Jones family: The late, great genius Robert Trent Jones and his equally renowned sons, Robert Trent Jones II and Rees Jones, a.k.a. "The U.S. Open Doctor." Together, the three industry giants have designed or remodeled nearly 1,000 courses across the globe. The State of Virginia can now boast of its own version of the Jones Trail highlighting essentially three eras of course design. 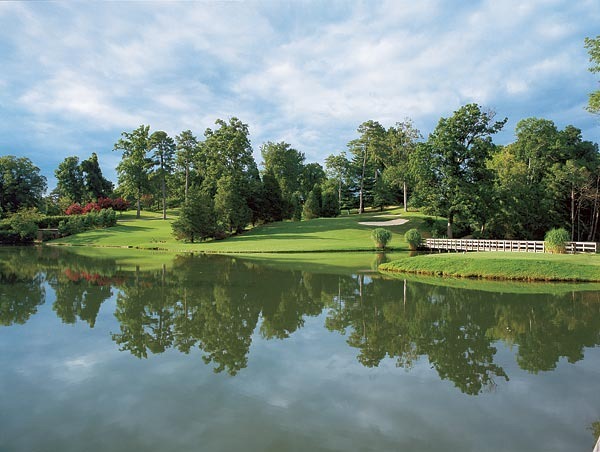 Golfers can play the Golden Horseshoe’s Robert Trent Jones-designed Gold Course and Rees Jones-designed Green Course. A short trip down Intestate 64 from Williamsburg lies the popular Rees Jones-designed Club at Viniterra in New Kent. Viniterra is quickly becoming one of the regions’ most popular courses. The Golden Horseshoe Golf Club is located just a few miles from Colonial Williamsburg’s Historic Area. Two internationally acclaimed courses — the Gold and the Green — as well as the executive-length Spotswood Course make Golden Horseshoe one of the premier members of the "Resort Collection of Colonial Williamsburg." Fittingly for a family destination, golf at Golden Horseshoe is a father-son affair. Trent Jones Sr. designed the Gold Course in 1963 and Rees came along to build the Green Course nearly 30 years later. Golden Horseshoe’s Gold Course combines panoramic views with intriguing and often-difficult shot demands; or as Trent Jones Sr. called it, "a natural arboretum upon which a great golf course has been built. The overall result is perfection." Opened in 1963, the Gold Course is both an enduring example of traditional golf course architecture – walk able and free of surrounding real estate development – an excellent counterpart to its companion Green Course, which at 7,120 yards plays a little tougher than its sibling. The par on Green is 72, the course is rated an intimidating 75.1, with a slope of 134. Rees incorporated rolling fairways among old-growth woodlands with water in play of six of the 18 holes. "The course defines the shot," he said, "but gives the player several options. It’s a shot maker’s course." The Green Course hos ted the 2004 U.S Women’s Public Links Championship. 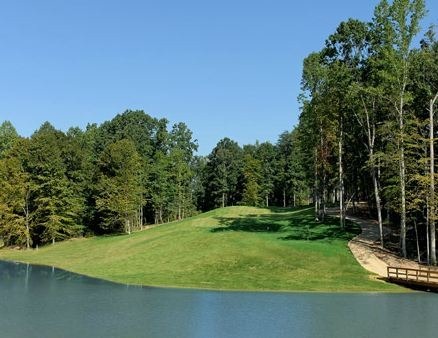 Located just off I-64 in New Kent toward Richmond, The Club at Viniterra opened in late 2009 as an amenity to help sell real estate and once the golf course fully matured, the developers elected to open the course for public play earlier this year. Needless to say, Viniterra has won the hearts of the area’s golfers. Built upon nearly 1,200 acres of wooded and rugged terrain, Viniterra can stretch to nearly 7,800 yards from the tips and flies against the grain of your typical Tidewater design. With massive fairways and run-ups to nearly all of its jaw-dropping green complexes — combined with the thoughtful and strategic placement of various grass, sand and water hazards — Viniterra is enjoyable for golfers who select the proper set of tees, as some holes offer up to a dozen different teeing grounds. The masterful Jones course routing incorporates many of the diverse, natural features of the site including frequent and dramatic elevation changes, various wetland areas and portions of mature, deciduous forest. Where appropriate, ponds and a total of 13 bridges were built to provide both strategic and aesthetic value. "What you see [at Viniterra] is what you get in terms of being able to see most every shot on the golf course," said Jones. "There are generous fairways and open approaches to many of the greens. If you have happen to go over some greens, there are catch basins and grass hollows to capture those shots." This article is brought to you by local resident and REALTOR, John Womeldorf, known around town as “Mr. Williamsburg” because of his extensive knowledge of the Williamsburg/Hampton Roads area and its real estate market. If you are relocating, retiring, seeking a vacation home, or simply curious about homes and neighborhoods in the Williamsburg/Hampton Roads area, John is happy to help. Click here to send him an email, or call him at 757-254-8136. Are the schools good? How is the traffic? Can you hear planes from nearby airports? Where is the closest grocery store? Click here to email John about arranging a tour, or call or text him at 757-254-8136. Are You A Military Family? The Williamsburg/Hampton Roads area is home to many military families. John is experienced in helping them with the unique issues raised by frequent relocations, and he understands the kind of support team it takes to make smooth transitions both into and out of the area. Click here to email John about your needs and concerns, or call him at 757-254-8136. Active Adults/55+ Communities, Golfing Communities, Building Lots, Foreclosure/REO Properties, Townhomes, Condominiums, Waterfront, Walk able, Horse Properties and more…. If you have a specific type of property in mind, John can help you find it. For assistance in unearthing just the right property in the Williamsburg/Hampton Road area, click here to contact John by email, or call or text him at 757-254-8136.